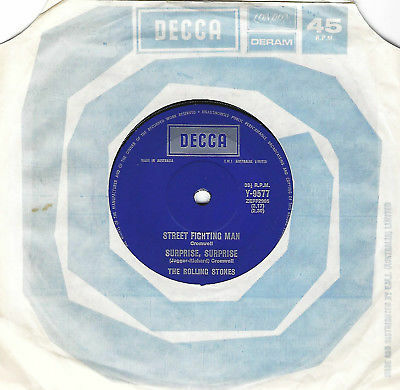 The Rolling Stones STREET FIGHTING MAN / SURPRISE, SURPRISE Australian RARE 7"
EXTREMELY RARE and out-of-print LIMITED EDITION Australian 3-track SEVEN INCH VINYL SINGLE called "STREET FIGHTING MAN / SURPRISE, SURPRISE". Released in Australia on Decca Records (Cat# Y-9577 ) from 1971. Record and sleeve are in excellent condition. Airmail postage is AUD $8-. Items are not available for collection. Payment via Direct Deposit, Paypal, USD$/AUD$/UK Pounds/EURO or Money Orders in Australian dollars.